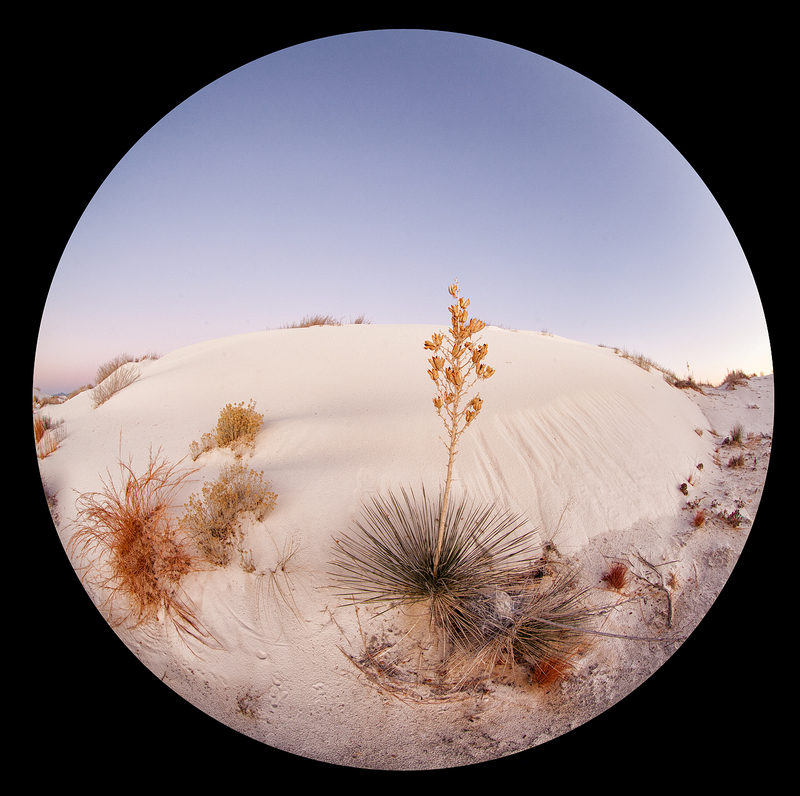 This image was created this morning (11/28/2011) at White Sands National Monument outside of Alamagordo, NM with the tripod-mounted Canon EF 8-15mm f/4L Fisheye USM Fisheye Ultra-Wide Zoom Lens and the Canon EOS 5D Mark II Digital Camera. ISO 200. Evaluative metering +1 1/3 stop: .8 sec. at f/16 in Av Mode. Gitzo 3530 LS tripod with the Giottos MH 1302-655 (Tiny) BallHead. Wimberley P-5 camera body plate. Live View (for mirror lock-up) with the 2-second self timer. IS turned off. Double Bubble Level in the hot shoe. Rear Focus AF and recompose. Click here if you missed the Rear Focus Tutorial. For a greater appreciation of the image, click on the photo. Then click on the enlarged version to close it. All My Life’s a Circle. One of my very favorite Harry Chapin songs. Hear it here. The song is also titled a more simple, “Circle.” And now circle is one of my very favorite lenses…. I knew that I would be heading to White Sands with Robert O’Toole for a day or two so I asked to borrow the relatively new (and amazing) Canon EF 8-15mm f/4L Fisheye USM Fisheye Ultra-Wide Zoom Lens. Thanks a stack to the kindness of Yechiel Orgel of B&H for the loan. When you use this lens with a full frame camera (as I did above) you can zoom between true 8mm circle and a 15 mm fisheye focal lengths; be sure to zoom out to the 8mm setting and remove the lens hood to prevent vignetting. With a 1.6 crop factor camera like the Canon EOS-7D you get a full frame fish eye image at the 8mm setting. Note: Click on the link for the circle lens to enjoy $50 instant savings (expires 11/31/2011). To learn more about this lens check out the customer reviews by clicking on the appropriate tab here. If you purchase this lens using our B&H link: Canon EF 8-15mm f/4L Fisheye USM Fisheye Ultra-Wide Zoom Lens you will earn a free contest entry and in addition, I would be glad to send you a short tutorial on how to crop your circle images to a perfect circle. (Please request the tutorial via e-mail along with a copy of your B&H receipt. Please feel free to leave a comment on either the image or Harry Chapin or ask a question about the lens. Canon EF 8-15mm f/4L Fisheye USM Fisheye Ultra-Wide Zoom Lens An amazing piece of lens technology that is both a challenge and great fun to use. Aye aye, that almost looks fishy to me. Strange how artificial a landscape can look with an ultrawide, yet underwater it can seem more natural. Hmm, maybe it’s because a lot of us are to familiar with TV and video that uses similar lenses. Neat image. I bet the lens it a lot of fun. I may have to see if I can get my hands on one. I wonder if some shading around the circle would make it look more 3D. Great image, great title, and great song! I love the effect in the image above. This would be a great lens in a housing for underwater photography.